Let us clarify from the start of this article that there's absolutely nothing wrong with dark furniture finishes. In fact, they're quite popular. That being said, if you're dealing with limited square footage, light finish options will do wonders towards making your space feel larger and more open. Light tones like maple and walnut are rapidly becoming go-to options for furniture shoppers in restricted work areas. Today on the blog, we'll highlight some of the most popular light wood components on the market to consider for your projects. Enjoy! Need a full service office furniture collection to create fluidity throughout your interiors? Check out Superior Laminate from Offices To Go. This popular line provides exceptional value and an all new light wood finish option called Autumn Walnut that was released just this month. Superior Laminate components in Autumn Walnut provide beachy vibes that make a statement without being overly modern. 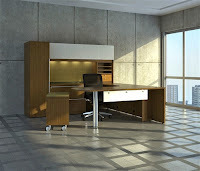 Interior design teams love the latte finished office furniture from the Cherryman Verde series. This modern line of desks, conference room tables, and office storage components is sure to earn an abundance of compliments from even the harshest critics. Many of the Verde office desks and tables even feature white accents that will really make your interiors pop. Looking to make your guest reception area feel more open and spacious? Consider a maple finished reception desk from the OFM Marque collection. This line of curved stations provides exceptional appeal from any angle. OFM Marque reception stations are available in multiple sizes that look great with silver accents. These designer desks for the reception area require no tools for assembly. Talk about user friendly! If you're ready to go all in on the light finish trend, the team at Global has your back. They offer fashionable options like Tiger Walnut that will do wonders for your professional work environments. Popular Global furniture and seating collections like Zira are available in this light laminate tone. There's also a lot to be gained by integrating light wood chairs in your private interiors and guest welcoming areas. 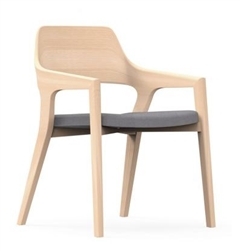 Light wood side chairs like the CRZ505 Natural Ash Crazy Horse from iDesk are ready to make a statement while making your office common areas appear larger and more open. This contemporary accent chair is sure to make an impression. The Crazy Horse chair can be effectively used as a main focal point of any welcoming area. It's also versatile enough to blend in when needed. This comfortable accent chair with a well padded seat is an all around industry favorite!